Homemade is so much more delicious and nutritious. It made me so sad when I saw the Jamie Oliver segment and the kids didn't care how disgusting it was! I just bought some chicken tenders and wasn't sure want to do with them. These will be perfect since I am headed back to work next week! Do you think these could be frozen after being cooked and then reheated in the oven? I'm looking for recipes that I can freeze for my boyfriend since he just moved out of town for a job and doesn't cook much for himself. Erin, I haven't done that, so I'm not sure. I'd just make a batch and freeze 1 or 2 to test out. These sound fantastic! I love how quick and easy they are to make. 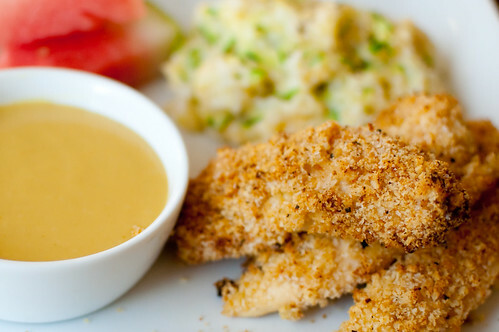 We love baked chicken fingers and the twist of lots of dijon sounds delicious! Can't wait to try! made these last night for dinner....came out AWESOME!!! cant wait for leftovers today! I made these for the super bowl last weekend and they were SO GOOD!! Making them again tonight!! I love chicken nuggets, but my waist doesn't. I'm not a big fan of preservatives either, so I'll try this recipe pretty soon. We enjoyed these. My husband didn't believe they weren't purchased from the Publix deli! Yum! I love how you said "with a baby on the way"... bet when you posted this you had NO idea where your life would be in 2013!